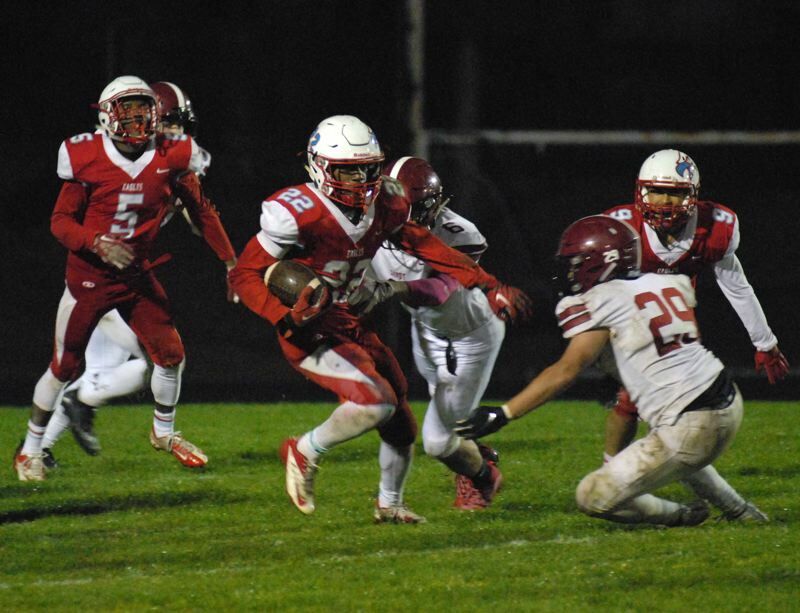 With their wild card playoff hopes still up in the air, the Sandy football team picked a really good time to pick up their first Mount Hood Conference victory. Quarterback Chet Chamberlain and running back Colby Carson each had three rushing touchdowns for the Pioneers as Sandy ran for 395 yards and broke their three-game losing streak with a 40-26 win over Centennial on Friday night. "I thought we played our butts off," Sandy head coach Joe Polamalu said. "When you're playing away from home, you just got to find a way to get the W."
Chamberlain, who had 213 rushing yards on 28 carries for the game, got this Sandy offense started with a 35-yard touchdown run in the opening quarter. The junior signal-caller was able to punch it in from a yard out in the second period to make the score 14-0. But Centennial would come back with a response thanks to quarterback Cyrus Boatman. While both Boatman and Kyle Fitzgerald have been under center for the Eagles this season, Fitzgerald had been the one that has gotten the majority of the snaps. But after Centennial's 54-0 loss to Barlow in their previous game, head coach Butch Self decided that Boatman would be the one to run the show. With a 6'2, 235-pound frame, Boatman proved to be tough to stop in Centennial's veer offense as his 20-yard touchdown run in the second period cut Sandy's lead to 14-7. "I'm comfortable with the veer because I have been running it my whole life," Boatman said. "I knew what we were going to do coming into the game and I just wanted to bring a spark to this offense." Centennial running back Jimmie Barton also played a huge factor in the Eagles ground game with 135 yards and two touchdowns. His first score came late in the second quarter when he broke past the Pioneers defense for a 78-yard score, which brought Sandy's lead down to one before the half. That wouldn't be Barton's only huge play of the game. Look for extended coverage in the Oct. 23 print edition.